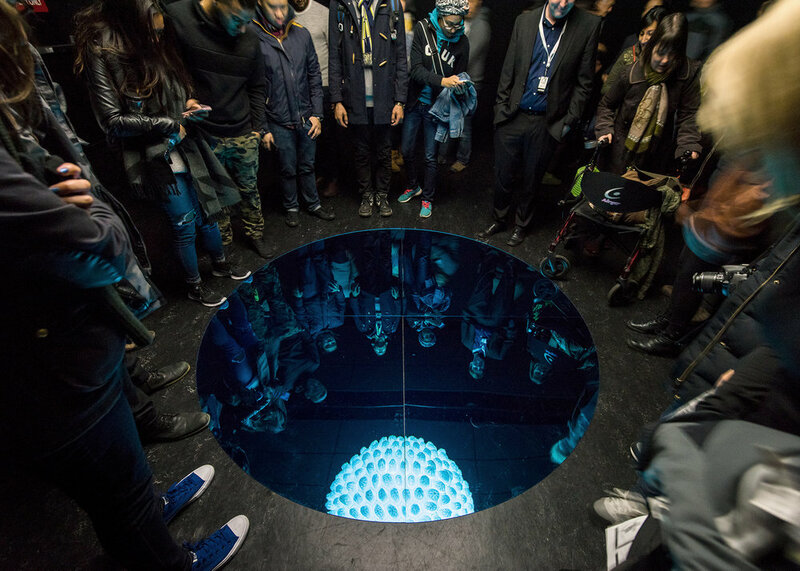 Nurun 'ala Nur [Light upon Light] (2015) is a sculptural installation consisting of a glowing spherical moon, whose surface is comprised of hundreds of prayer caps emanating light from within. The work rises from Syed’s memories and fascination with the full moon, its reflection and his obsession of finding ever more perfect parables, shapes and materials that are praised throughout history for their purity and Divine attributes. The arabesque design of the caps follows Islamic tessellation principles repeated seamlessly, suggesting the rememberance of Divine unity. The patterns on the caps, the formal construction of repeated shapes, and the use of the grid have strong roots in Islamic architecture, especially the dome, lattice and muqarnas. As a light sculpture, it addresses Islamic consciousness using signs of divine beauty (jamāl) and majesty (jalāl), and reflects a lifelong pursuit of the transient nature of beauty and perfection, presenting the viewer with a physical experience of a concept that is abstract in nature. The jamāli qualities of awe and beauty are created as a halo, creating a mesmerising tactile allure promising a cosy embrace, which seduces viewers to come closer to contemplate and be surrounded by the work, which is reflected in a ‘pool’ of ocean-blue glass below. The suspended sculpture and the reflective glass on the floor are expressions of the balancing act and harmonious spiritual dualities of the Islamic concepts of beauty and majesty, in an era when Islam finds itself constantly drawn towards narrative extremes.